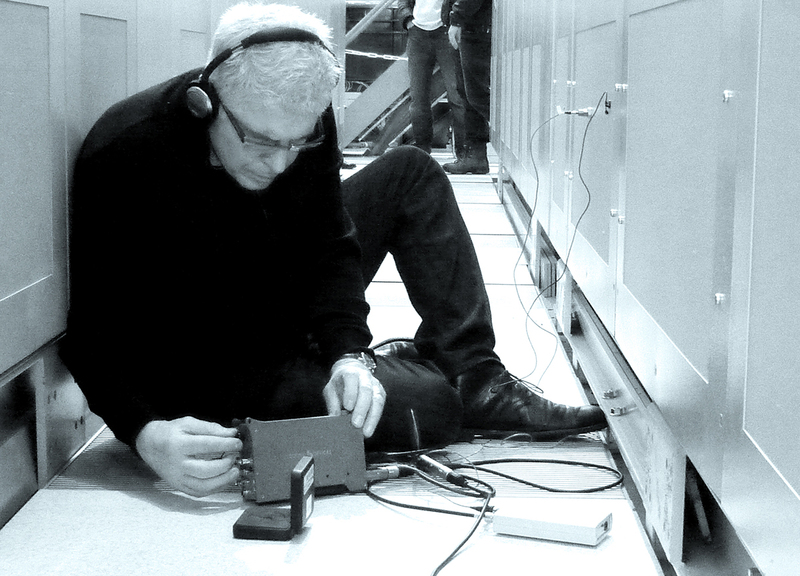 Sound artist Bill Fontana taps into the music of the Large Hadron Collider. When Bill Fontana visits a cafe, he’s one of many customers wearing headphones. To a casual observer, he looks like someone in his own private world, cut off from the life around him. In fact, it’s the opposite: Tiny, sensitive microphones are amplifying the sounds of the cafe—the clatter of dishes in the kitchen, the laughter of the people at the table next to him, the espresso machine hissing and bubbling—and pumping them into his ears. Fontana devotes his life to capturing and treasuring the music of the moment. It was in this spirit that he applied for the Prix Ars Electronica [email protected] award, for which a digital artist receives a monetary prize and a three-month residency made possible through a collaboration between CERN and international cyberarts organization Ars Electronica with funding from external private donors. Bill Fontana plugs in and listens to the sound of POPs—POwer for the Proton Synchrotron—the energy generator and storage facility, which provides energy to a key component of CERN’s accelerator complex. Fontana, 66, grew up in Cleveland, Ohio, in walking distance from the Cleveland Orchestra. He composed music in the 1960s, and began creating his first pieces of audio art in 1976. For the past three decades, his artistic palette has been the latent sounds of the world. Fontana creates sound sculptures—installations using microphones and speakers set up in museums and monuments—that transmit sounds from faraway places into new environments. When he’s working, Fontana carts around a suitcase full of sound gadgets and gizmos. But his primary tool is a device called an accelerometer. Engineers use accelerometers to measure vibrations in solid structures, and Fontana uses them as a way to expand his hearing. He’s plugged his extendable-ear into objects all over the world, like San Francisco’s Golden Gate Bridge and the Arc De Triomphe in Paris, as well as more obscure structures like a crane in Glasgow, a wharf in Sydney and a giant bell at a Buddhist Temple in Kyoto. The Prix Ars Electronica [email protected] selection committee appreciated his unique approach. “I think they like the idea of an old-timer like me,” he says. For someone with the knack for hearing music in machinery, the CERN complex is a veritable playground of sound. The LHC is currently undergoing repairs, but when Fontana visited for the first time, it was still running, whirring, banging and buzzing. During the whirlwind introduction, Fontana spent some time at the starting point of the LHC. There, atoms of hydrogen are stripped of their electrons so only positively charged protons remain. An electric field begins to accelerate the protons while a series of magnets focus them into a beam. Fontana recorded the sounds. The popping, tapping dance beat of the protons’ regular release is underlaid with the hiss of cooling water and the heavy clang of the magnets charging and discharging. According to Koek, Fontana listened to the proton source for a moment, and then handed his headphones to Detlef Kuchler, the physicist who prepares the protons and launches them on their journey. Kuchler has run the machine for 15 years, starting when it was a component of the accelerator that preceded the LHC. When Fontana slipped headphones over Kuchler’s ears, his eyes widened, and he laughed, Koek recalls with a smile. 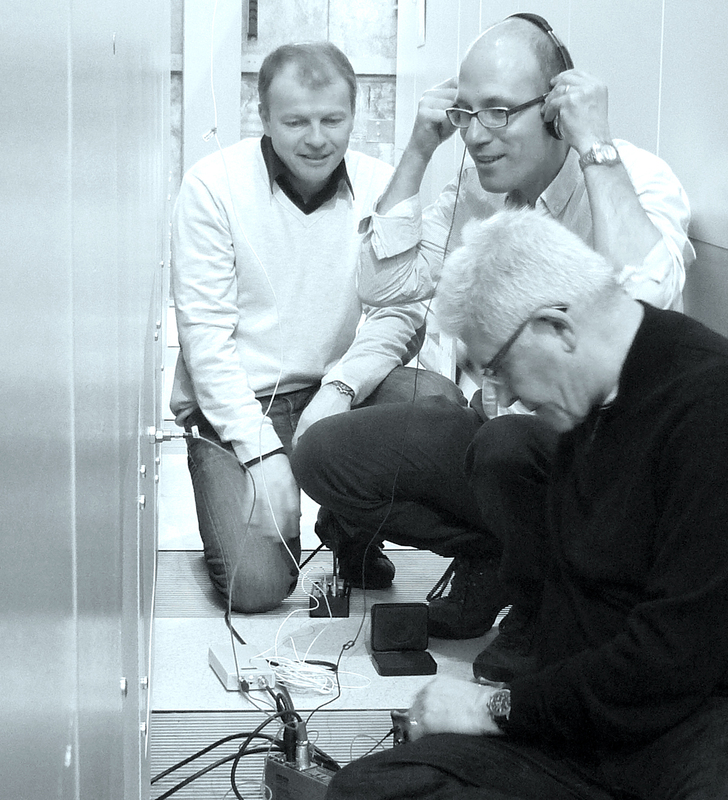 Karsten Kahle, an electrical engineer at CERN, listens to the sound of POPs, which he and Yves Gaillard (pictured left) helped to create. “Yes, it sounds like the title of a science fiction movie,” Fontana admits. He’s broadcasting the recording of the proton-source beat through various structures around CERN and within the LHC tunnel to discover how different materials affect the sound. The final sound sculpture will be made public in the coming months, but in the meantime, Fontana listens to the LHC with relish. An artist honors the people and science of the CMS collaboration. Julius von Bismarck uses rules to create a sense of chaos in his latest piece.